OXFORD — Late one night in May 2017, John Chappell, then a sophomore at the University of Mississippi, pulled out his laptop to research a hypothesis. Chappell, an Albuquerque native, had just finished reading several books on voting rights and found a map of the legislative districts in his adopted home state. One district in particular stood out to him: Senate District 22, a section of the state zigzagging 120 miles southward from the Delta fields to the affluent Jackson suburbs. He began writing down the individual voting precincts in the district and noting their racial demographics. He looked at similar demographics of precincts in neighboring districts. When he read the Voting Rights Act of 1965, which required states like Mississippi with a history of race-based voting discrimination to get approval to change voting laws, he knew he was onto something. University of Mississippi student John Chappell redrew Senate districts into this map as an alternative to the current Senate District 22, which federal courts say violates the Voting Rights Act. So in about ten hours over two nights, Chappell sat at his laptop and redrew the district so it would conform with federal law. That meant replacing some precincts in Senate District 22 with precincts in neighboring districts. He merged the precincts that had been split into separate Senate districts, color-coding each precinct onto a spreadsheet so he could track which precincts should move to a new district. All the while, he ensured that the contiguity and compactness of each newly drawn district adhered to federal and state standards of size and demographics. In all, Chappell’s map made changes to three Senate districts. “It was a matter of taking all these puzzle pieces of the precincts and placing them together in ways that make sense,” Chappell said. After the two nights he spent on the project, he emailed his research to Beth Orlansky, the advocacy director at the Mississippi Center for Justice. A few weeks later, Jackson attorney Rob McDuff and attorneys at the center used Chappell’s research to locate plaintiffs and draft a federal lawsuit. It appears Chappell’s work paid off. This month, U.S. District Judge Carlton Reeves ruled that Senate District 22, currently held by Senate Appropriations Chairman Buck Clarke, R-Hollandale, violated the Voting Rights Act because it “does not afford the plaintiffs ‘an equal opportunity to participate in the political processes and to elect candidates of their choice. '” Reeves ordered the Legislature to redraw the district by April 3. The 5th U.S. Circuit Court of Appeals upheld Reeves’ ruling days later. The ruling also gave candidates until April 12 to qualify to run in the districts affected by the redrawing. A plan the state Senate adopted Tuesday moves African American voters from Delta-based District 13 to District 22 in order to comply with the federal court order and must also be approved by the House and federal courts. Under that proposal, which the House could take up as early as Wednesday, the African American voting age population in District 22 will increase from 50.77 percent to 58.13 percent. In District 13, the black voting age population will decrease from 69.27 percent to 61.84 percent. The plan will move five precincts in Bolivar County from District 22 to District 13 and will move three precincts in Sunflower County from District 13 to District 22. Clarke, the current senator from District 22, is white and chairs the powerful Senate Appropriations Committee. He announced earlier this year that he is running for state treasurer, a political move he said was inspired, in part, by the federal lawsuit. Sen. Willie Simmons, D-Cleveland, who represents District 13, also spoke in favor of the plan. Like Clarke, he is not running for re-election, opting to run instead for Central District Transportation commissioner. His daughter is running for the District 13 seat. Simmons said he believes that an African American candidate would have a chance to win election in both redrawn districts. The 52-member Senate has 15 black majority districts, including the current District 22. But plaintiffs argued that the elongated District 22 that had no base made it difficult for an African American candidate to win elections. There are currently 13 African Americans serving in the Senate. One of the plaintiffs in the lawsuit was Joseph Thomas, who ran and lost an election for the District 22 post and has qualified to run for the post again this year. Chappell, who is involved in campus activism, including as one of the students who devised a plan to have a campus Confederate monument moved to a cemetery, majors in international studies and Arabic. After he graduates in May, he will pursue a master’s degree in foreign service at Georgetown University. “There was always a little hope that this could go all the way, but seeing it progress has been incredible. To think it started working late into the night at a laptop, hand drawing these districts with a marker on something I printed off at my printer at home, it’s incredible,” he said. CONCORD, N.H. (AP) — The latest effort to remove partisanship from the process of redrawing New Hampshire's legislative districts cleared the state Senate on Thursday over the objections of Republicans who argued it would violate the state Constitution. The Democratically controlled Senate voted 14-10 along party lines Thursday to create a 15-member independent commission to redraw the state's two congressional districts, five Executive Council districts, 24 state Senate districts and districts for the 400 House seats. The bill now goes to the House, which has already passed a similar bill. Republican Gov. Chris Sununu opposes the idea. Supporters argued the current system that puts lawmakers in charge of redistricting allows for gerrymandering, in which boundaries are drawn to benefit the party in power. "Representatives and senators should not choose their voters, voters should choose their representatives," said Sen. Shannon Chandley, D-Amherst. "Please vote for Senate Bill 8, so we can say firmly to all our constituents that we respect you as a voter, we respect our democracy and we stand for fair elections." Opponents argued that the Legislature shouldn't outsource its responsibilities to a commission and noted that the state Constitution requires the Legislature to set election districts. "There is a legislative process. A committee is formed, their meetings are held in public, public input is taken. Nobody's voice has been quieted, in fact, sometimes those public hearings were quite contentious," said Sen. Sharon Carson, R-Londonderry. The current district designations were approved in 2012, when Republicans controlled the Legislature. But the map was vetoed by Democratic Gov. John Lynch, who argued it was unconstitutional because it denied 62 towns and wards their own seats in the House and that it needlessly broke up municipalities. The Legislature overrode the veto, and the state Supreme Court later found the plan constitutional. Lawmakers killed several bills in recent years that would have created an independent commission to handle redistricting. Another failed bill sought to take not just politics out of the process but people. It would have created a procedure to draw electoral districts using a computer algorithm. The House also considered a constitutional amendment this session to create an independent commission, but it was retained in committee. Supporters of the Senate bill defended its constitutionality, noting that the commission would submit its recommendations to the Legislature for final approval. "Are we just going to do nothing and wing it, and say, 'Whatever party's in control, have at it'?" said Sen. Dan Feltes, D-Concord. "Or are we right now, before the 2020 election, going to say, 'Let's be independent and fair, regardless of which party it is.'" The Supreme Court will hear arguments Tuesday in cases that could lead to historic safeguards on the fundamental constitutional right of all Americans to have their votes count. In considering a Republican gerrymander in North Carolina and a Democratic gerrymander in Maryland, the court has a golden opportunity to rein in partisanship and change the way congressional district maps are drawn across the nation. In Maryland, the case involves a single congressional district. The evidence is clear there as well. Then-Governor Martin O’Malley said in legal proceedings that the Democrats were trying to make it harder for Republicans to elect a single member of Congress — specifically targeting a Republican incumbent to try and push him out. A new Associated Press analysis shows that while Democrats netted 40 House seats and a majority in last year's midterm elections, Republicans won 16 seats they would have lost without the help of district maps gerrymandered by the GOP. Clearly, a national solution is needed before more states copy the cynical playbooks used by Wisconsin, North Carolina, Maryland and other states. A practice detested by the vast majority of American voters, partisan gerrymandering, has received bipartisan condemnation in recent months. Last year, for example, when the Supreme Court heard a case out of Wisconsin, Gill v. Whitford, the critics of the gerrymandered legislative map included not just the Democratic voters who brought the case but also scores of prominent Republicans. Disregarding the fact that their party benefited from the biased district map, they urged the court to rein in the gerrymandering and protect American democracy. The Republicans crying foul included Sen. John McCain, Ohio John Kasich, former Senate majority leader Bob Dole, former California governor Arnold Schwarzenegger, and many others. Their stated views were consistent with those of a supermajority of the American people. In a December survey of likely 2020 general election voters commissioned by the nonpartisan Campaign Legal Center, where I am vice president, 72 percent of Americans support the Supreme Court setting clear rules for when gerrymandering violates the Constitution, with broad support across party and racial lines. Voters overwhelmingly prefer congressional districts with no partisan bias, even if it means fewer seats for their own party, and this sentiment is equally strong across partisan lines. This makes sense. People understand that majorities in state houses and in Congress come and go. Today, it may be your party reaping the benefits of increasingly sophisticated computer modeling to manipulate districts and hold onto power. You might be fine with your elected officials ignoring voters in your district that hold opposing views. But it won’t last forever. As soon as the gavel is passed to the other party, you will notice some important changes. The feeling of being “robbed of your voice” on the issues that matter and being unrepresented settles in for the next decade. This feeling is well-documented. We have plenty of evidence that given control of the process, each party will rig the district lines of their state to the greatest extent possible. We need a legal solution that will last. Americans’ disgust with gerrymandering was again on display in November when efforts to amend state constitutions to require independent redistricting commissions went a perfect five-for-five at the ballot box. The Campaign Legal Center poll showed that voters favor independent redistricting commissions by a 3:1 margin. This is a profound acknowledgement by voters that politicians can’t be trusted to solve this problem. However, this solution will not work nationwide. Some states have a ballot initiative process that can be used only with legislative consent. Given the resistance of legislators to reform, in those states, citizens have little recourse. For them, the courts must order their state to draw fair maps. The Supreme Court has never struck down an election map as an unconstitutional partisan gerrymander. I argued Gill v. Whitford before the justices in October 2017, and we had high hopes that the court would finally take action against a practice that is obviously and egregiously unconstitutional. Ultimately, though, the court chose instead to temporize, sending the case back to the lower court for us to prove our injuries on a person-by-person, district-by-district basis. The current court under the leadership of Chief Justice John Roberts seems to be wary of being forced into the business of ruling for and against Democrats or Republicans and thus appearing to be partisan and political. By hearing these two cases now, and ruling for the challengers in each, it can instead send a message of apolitical disapproval of democracy-distorting district maps — a message that extreme partisan gerrymandering is unconstitutional, no matter which party does it. The National Republican Redistricting Trust, the GOP’s data and legal hub preparing for redistricting after the next census, has brought on former Wisconsin Gov. Scott Walker as the group’s national finance chairman. Walker said next month’s Supreme Court race in his home state is an example of Democrats’ unrelenting focus on setting up redistricting in 2021 and beyond. The Democratic-backed state Supreme Court candidate has a massive TV advertising advantage heading into the April 2 election, according to a strategist tracking spending in the race, which also features Walker’s former chief legal counsel. Holder recently attended events in Wisconsin, and the NDRC’s nonprofit arm has pumped in hundreds of thousands of dollars. The state Supreme Court could play a major role in drawing future political maps in Wisconsin, if it has to navigate a split between the GOP-controlled Legislature and the Democratic governor in 2021. “This is just an example of how Democrats have really put this at the forefront, and Republicans need to do the same,” Walker said. That is Walker’s brief at the NRRT. The GOP redistricting trust launched in 2017 with plans to raise $35 million to gather and warehouse key data for redistricting and fight court battles over political maps, and Walker is now charged with raising the money to power those efforts. “Governor Walker will be a tremendous asset to the NRRT as we prepare for the next round of redistricting,” Adam Kincaid, NRRT’s executive director, said in a statement. The group’s budget may even grow as the intensity and number of redistricting fights ratchet up, said Jason Torchinsky, a veteran Republican election lawyer who serves as the NRRT’s general counsel. “If anything, we might be aiming higher than that, given the resources Democrats are dumping into these cases,” Torchinsky said. He noted that court battles about the current round of political maps are still raging nearly a full decade after they were drawn. “The fact that the Supreme Court is hearing, in year nine of a redistricting cycle, four cases that impact redistricting — that shows why we need folks like Governor Walker helping out on our side,” Torchinsky added. The redistricting trust will not be Walker’s sole political project — he told The Washington Post this week that he will also lead a group campaigning for a constitutional balanced budget amendment, and he could also run for office again in the future. But Walker made clear that he sees redistricting as a fight that could tilt the next decade of national politics. “I know firsthand the impact the other side’s efforts can have on this,” Walker said. If Wisconsinites can agree on one thing, it is that our right to vote is a fundamental American principle. When we vote, we are voicing our view about how we want to shape the future for our families and communities. Unfortunately, far too many Wisconsin voters live in noncompetitive districts where their voice is silenced by partisan gerrymandering and wealthy special interests. Before the redrawing of the new voting maps in 2021, we have a window to make important changes to this process both here in Wisconsin and nationally as the U.S. Supreme Court gets ready to hear two historic challenges to the constitutionality of partisan gerrymandering. For years, Common Cause in Wisconsin and its allies have been organizing citizens across the state in support of redistricting reform. Our organizing efforts are based on a very simple idea: Voters should get to pick their politicians, not the other way around. Yet here in Wisconsin, when the Republican-controlled Legislature drew the current congressional and state legislative voting maps in 2011, they had only one thing in mind: keeping and expanding their power, regardless of the decision and will of Wisconsin voters at election time. Wisconsin’s voting maps are among the most gerrymandered in the country. Nine of 10 voters have no real choice at the polls, because the maps were drawn by partisan politicians to guarantee a certain election outcome. That is not how democracy is supposed to work. That’s why Wisconsin needs to adopt a nonpartisan redistricting process, where the lines are drawn fairly and districts reflect the communities they serve without partisan considerations. We do not have to look any further than to our neighbors in Iowa, where this type of reform has worked to ensure impartial voting maps. All in all, 17 states impose greater checks and balances on redistricting, and Wisconsin should become the 18th. Wisconsinites also need a national standard, and voters should not have to wait another three years to be able to have fair maps. That’s why two current cases at the U.S. Supreme Court are so important. On March 26, the Supreme Court will hear oral arguments in Rucho v. Common Cause, which challenges Republican gerrymandering in North Carolina, and Lamone v. Benisek, which challenges Democratic gerrymandering in Maryland. By taking up both cases, the court is showing that the fight for fair maps is not partisan and that both parties participate in this bad process. Both cases are similar to a Wisconsin case, Gill v. Whitford, which the U.S. Supreme Court sent back to a lower federal court last year on the issue of standing. But the North Carolina and Maryland cases are unlikely to suffer from the same standing issues as the Wisconsin case because they focus on a district-specific analysis versus a statewide analysis. This is a historic opportunity for the Supreme Court to stop discrimination based on political expression through partisan gerrymandering. The high court should strike down gerrymandering and declare the practice illegal and unconstitutional nationwide. A definitive decision will accelerate people-powered movements to put mapping in the hands of impartial citizens rather than self-serving politicians. Politicians will not simply give up their power to gerrymander without a fight. As the Supreme Court hears these two important cases and other litigation continues, your elected officials in Madison need to hear from you. It is going to take all of us to unrig the unfair practice of partisan gerrymandering. We need tens of thousands of Wisconsinites to contact both their state senator and their state representative and urge them to support nonpartisan redistricting reform, specifically the Iowa model legislation. Both the Wisconsin Legislature and the U.S. Supreme Court have a clear opportunity in front of them. They can make the definitive, revolutionary change we need so that Wisconsinites, and all Americans, can hold their elected officials accountable on Election Day. Voters need genuine representation in their state legislatures and in the U.S. House of Representatives. Now is the time for the people, rather than the politicians, to decide who represents them. Somewhere, in an alternative universe where the winner of the 2016 presidential election lives in the White House, partisan gerrymandering is unconstitutional. Justice Merrick Garland provided the key fifth vote in Gill v. Whitford to strike down the Wisconsin Republican Party’s aggressive effort to immunize itself from elections. Lower courts are busy dismantling gerrymanders in states like North Carolina, Ohio, and Maryland. And in 2018, Wisconsin held its first competitive state assembly elections in years. Meanwhile, here in this universe, the picture is much more grim. In 2018, Democratic Wisconsin state assembly candidates won 54 percent of the two-party popular vote, beating their Republican counterparts by 8 percentage points. Yet Republicans won 63 of the state’s 99 assembly seats. With Republicans in firm control of the Supreme Court in 2018, the high court decided not to decide Gill, leaving Wisconsin’s gerrymander in place. Then Republicans gained an even tighter grip on the Supreme Court when Justice Anthony Kennedy — the court’s occasional swing vote and the only member of its Republican majority who appeared open to striking down partisan gerrymandering — left the bench. All of which is a long way of saying that the outcomes in Rucho v. Common Cause and Lamone v. Benisek, two partisan gerrymandering cases that the Supreme Court will hear next Tuesday, are practically preordained. The Court will almost certainly vote 5-4 to hold that such gerrymanders cannot be dismantled by federal courts. Republicans will keep the profound advantages they gained in 2010, thanks to the coincidence of the fact that the GOP had a strong electoral year immediately before a redistricting cycle. States like Wisconsin will remain sham democracies. America got to this point, moreover, not because Republicans won national elections fair and square and that gave them the power to appoint pro-gerrymandering judges to the Supreme Court. We got here because the anti-democratic pathologies of the U.S. Constitution have begun to snowball — working together to preserve themselves and to promote further democratic erosion. Donald Trump would not be president if not for the Electoral College. Mitch McConnell would not be Senate Majority Leader if not for the malapportioned Senate. Neil Gorsuch and Brett Kavanaugh owe their jobs to the fact that the United States does not have free and fair elections. And they are now poised to use their offices to further entrench Republican rule. Rep. Alexandria Ocasio-Cortez (D-NY) is, at age 29, the youngest member of Congress. As Mother Jones’ Tim Murphy notes, she’s lived through exactly one presidential election where Republicans won the nationwide popular vote. She shares this distinction with every American under the age of 30. At 41, I’ve only been eligible to vote in one election, the election of 2004, where the American people voted to elect a Republican president. In 2022, assuming that Trump does not become the second Republican in AOC’s lifetime to win the popular vote, there will be young voters who’ve never lived through an election in which a Republican president won the popular vote. And yet Republicans control the White House, the judiciary, and the Senate. As Crooked Media’s Brian Beutler notes, this disparity produced an entire generation of Americans who not only do not know what it is like to live in an America with democratic elections, and who, as a result, may never get to see the policies they support enacted. The fact that the United States does not choose its presidents through free and fair elections is exacerbated by the fact that we do not choose who controls the Senate through free and fair elections. The state of California has 68 times as many people as the state of Wyoming. Indeed, the fourth largest city in California, San Francisco, has more than 300,000 more residents than the entire state of Wyoming. Yet Wyoming still gets two senators, just like California — effectively giving each person in Wyoming 68 times more representation than each Californian. Gorsuch and Kavanaugh are the only members of the Supreme Court in U.S. history who were nominated by the loser of the popular vote and confirmed by a bloc of senators who represent less than half of the nation. America’s anti-democratic pathologies work in symbiosis. Sham elections beget anti-democratic judges, who render our elections even more of a sham. Even before Kavanaugh’s arrival, the Supreme Court’s Republican majority cut deep into America’s democratic norms. Citizens United v. FEC released a torrent of money into our elections. Shelby County v. Holder gutted much of the Voting Rights Act. A more obscure case, Abbott v. Perez, held that white lawmakers enjoy such a strong presumption of racial innocence that it is virtually impossible to prove that they acted with racist intent when they wrote an election law that undercuts voters of color. Chief Justice John Roberts, moreover, has fantasized about hobbling what remains of the Voting Rights Act since he was a young Reagan administration lawyer. And he’s widely considered the most moderate member of the Supreme Court’s current Republican majority. Ordinarily, when the Supreme Court takes up monumental cases like Ruchoand Benisek, my job is to lay out the legal issues in those cases and offer some insight into how key members of the Supreme Court are likely to analyze those issues. I suppose I could do that now. I could throw around terms like “efficiency gap” or “viewpoint discrimination” or “cracking” and “packing.” I could note that Benisek involves a Democratic gerrymander in Maryland, and speculate that maybe that fact will help one of the court’s Republicans see that gerrymandering undermines core democratic values that go beyond party. But really, what’s the point? Chief Justice Roberts was open about his reluctance to strike down partisan gerrymanders when the issue was before him last term, and Roberts is, again, the least conservative of the court’s Republicans. Barring a miracle, Rucho and Benisek will build on cases like Citizens United, Shelby County, and Perez. 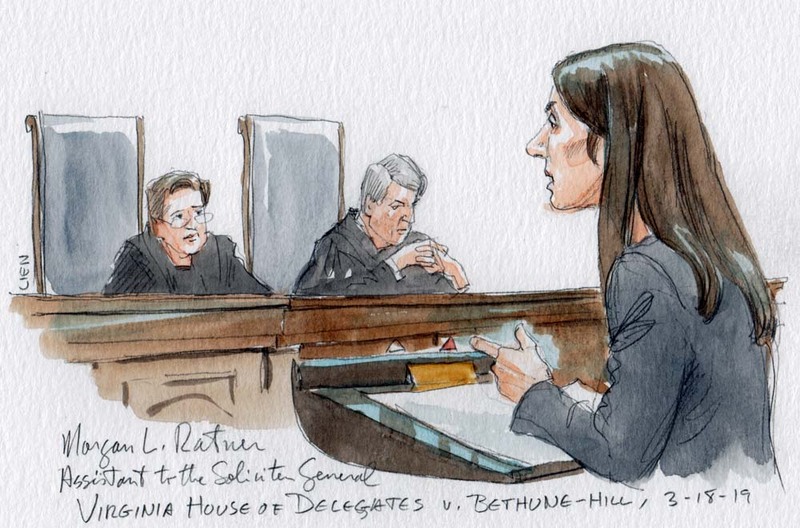 Democracy does not fare well in the Roberts Court. As I think about the almost certain fate of Rucho and Benisek and the constitutional thumb on our electoral scales that made this fate all but inevitable, I’m reminded of an interview that former Georgia gubernatorial candidate Stacey Abrams (D) gave at the Brookings Institution last month. Abrams knows something about voter suppression. Her opponent, then-Secretary of State Brian Kemp (R) served as Georgia’s top elections officer at the same time that he was running to become its chief executive. Kemp purged hundreds of thousands of voter registrations. Just days before the election, he launched a bizarre investigationagainst the state’s Democratic Party, claiming without evidence that Democrats “hacked” Georgia’s voter registration system. Votes still matter in the United States. Thanks to the Electoral College, Trump has a baked-in advantage when he runs for reelection. But if just under 80,000 people had voted differently in Michigan, Pennsylvania, and Wisconsin, Hillary Clinton would be president right now. Democrats face an uphill battle to regain the Senate, but close elections in North Carolina, Maine, Arizona, and Colorado could allow them to return Majority Leader Mitch McConnell (R-KY) to the minority. Whether they succeed is likely to determine whether they have any chance of confirming anyone to the Supreme Court. But the stakes for each election are far higher than whether America will get a single-payer health system or whether billionaires will get another tax cut. With each election that Democrats lose, Republicans will entrench their control of the judiciary even further — and they will use that control to squeeze Democrats even harder in upcoming elections. Democrats, meanwhile, cannot merely hope to hold onto power until America’s anti-democratic fever breaks. According to a University of Virginia analysis, just under half the country will live in only eight states by 2040 — so half the country will have just 16 senators while the other half has 84. About 70 percent of the country will live in only 16 states. If Democrats remain popular in population centers while Republicans continue to over-perform in sparsely populated states, in other words, Republicans will soon gain a permanent supermajority in the United States Senate — and with it, permanent control of the Supreme Court and a permanent power to reinterpret the Constitution. So Democrats have no choice but to confront the Constitution’s anti-democratic pathologies head on. If they allow Senate malapportionment to continue, they will cease to exist as a viable political party. The Supreme Court heard oral argument today in a challenge to the map drawn in 2011 for Virginia’s House of Delegates. A group of African-American voters allege that the state legislature engaged in racial gerrymandering – that is, it relied too much on race when it drew 11 of the state’s districts, which would violate the Constitution. But the state legislators defending the map argue that, although race was one of the factors that the legislature considered, it wasn’t the only one. After roughly an hour of debate today, it seemed quite possible, although not certain, that the justices would reject the racial-gerrymandering challenge and uphold the map. The lawsuit before the Supreme Court today was filed in 2014 by Virginia residents who live in 12 different districts in the state. When the legislature adopted the map in 2011, 55 percent of the voters in each of the 12 districts were African-American. The challengers contended that the legislature had illegally packed African-American voters into these districts, diluting their strength in neighboring districts and giving Republicans an advantage there. A federal district court ruled for the state legislature, which had stepped in to defend the law. The challengers went to the Supreme Court, which agreed that one of the districts was not the product of racial gerrymandering. The justices sent the case back to the lower court for it to take another look at the remaining 11 districts. When the case went back to the district court, the court threw out the map. It ruled that race had been the main factor motivating the design of each of the 11 districts. Moreover, the court found, the legislature had not shown that each district needed to have a voting-age population that was 55 percent African-American. The legislature appealed to the Supreme Court, which announced last fall that it would hear the case. Justice Ruth Bader Ginsburg was skeptical. Changes in district maps are frequent occurrences, she pointed out. In fact, they happen every time there is a new census. Justice Sonia Sotomayor was also dubious. She worried aloud that if the House of Delegates were allowed to appeal the district court’s decision in this case, it would mean that its counterparts in other state legislatures would be able to do the same in the future – even if, perhaps, the state’s attorney general might have a different position. And could individual members of the state legislature also appeal? Sotomayor asked Clement. It would be a “radical new step,” Sotomayor concluded. Clement offered an alternative theory: The House of Delegates also has a right to appeal the decision on behalf of Virginia, even though the state’s attorney general insists that only he has the authority to do so. 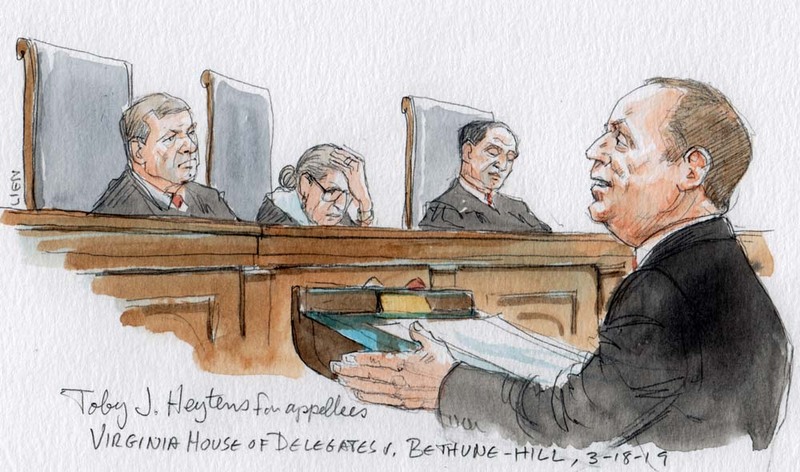 Clement stressed that the House of Delegates – with the blessing of state officials – had defended the map during the case’s first trip to the Supreme Court. Indeed, he observed, the justices even used the phrase “the state” to refer to the legislature then, because the House of Delegates was the only defender appearing in the Supreme Court. Justice Samuel Alito suggested to Clement that he would be “very uncomfortable” trying to decide whether, under Virginia law, the House of Delegates can represent the state in court proceedings, or whether that is a role reserved for the state’s attorney general. Alito proposed that the justices should instead ask the Virginia Supreme Court to weigh in on this question of state law, but his colleagues did not show much enthusiasm for that option. Justice Elena Kagan asked Clement whether, even if he is correct (and Kagan acknowledged that he seems to be) that Virginia’s attorney general previously was happy to have the House of Delegates “do the work” and represent the state in defending the districts, that means that the attorney general has permanently delegated the authority to represent the state to the legislature. Sotomayor criticized Clement’s response as a “pretty extreme statement,” but Clement held firm, calling it a consequence of the state attorney general’s choice. The justices spent less time on the merits of the racial-gerrymandering challenge, but they were equally divided when they did discuss it. Justice Brett Kavanaugh echoed the legislature’s argument that, when it drew the new map back in 2011, it was caught between a rock and a hard place. He told Marc Elias, who argued for the challengers, that the legislature would be “hammered” if it had aimed to have 52 percent, rather than 55 percent, of the voters in each district be African-American, because that number would be considered too low. How can the state comply with both the Voting Rights Act and the Constitution’s equal protection clause in this “narrow band between 51 and 55” percent? Kavanaugh queried. Roberts had an entirely separate concern, which he labeled the “elephant in the room”: the idea that the legal standard for determining whether race was a primary consideration in redistricting “depends heavily” on whether the trial court believes that witnesses are credible. In this case, Roberts noted, Delegate Chris Jones, who led the effort to draw the 2011 map, was regarded as credible at the first trial, but at the second trial – with a new judge – he was not regarded as credible, while expert witnesses were. If the case had come out the other way, Roberts emphasized, then the Supreme Court would have to defer to “questions of credibility that go the other way” instead. “Our review sort of depends on whoever gets here last,” Roberts concluded. Breyer was less convinced. He reminded Clement that there are “hundreds of thousands, if not millions” of trials. If some of them are reversed on appeal, what rule should trial courts apply when cases return to them? One possibility, Breyer suggested, would be to “forget about the first trial” and just look at the credibility of the witnesses in the second trial in the abstract. Justice Neil Gorsuch asked only one question today, while Justice Clarence Thomas was silent. Even if Gorsuch might normally be expected to be more sympathetic to the legislature than to the challengers, the challengers can take some comfort in the fact that earlier this year the Supreme Court rejected the legislators’ request to put efforts in the lower court to draw a new map on hold until the justices decide this case. And with the 2020 census looming, no matter what happens in this case, there will almost certainly be yet another map on the horizon. This post was also published at Howe on the Court. With a legacy going back almost a century and a presence in all 50 states, the League of Women Voters takes the long view on how voting district maps are drawn. In Wisconsin the league has been active on apportionment and redistricting since the 1930s. Through the decades our stance has sometimes lined up with that of one major political party or the other, but that is not because we have changed our minds about where we stand. The Wisconsin league adopted a position in the 1970s favoring voting maps drawn by a nonpartisan entity, rather than by the legislators who might want to ensure their own job security by creating “safe” districts. It’s the voters who should choose their representatives, not the other way around. Currently we support having a nonpartisan legislative agency draw the maps, a plan that has worked well in Iowa since 1980. Over the years our position has not sat well with the party in power. It is expected that a new bill will be introduced soon in the Wisconsin Legislature to establish a redistricting system similar to that in Iowa. If enacted, this would result in fair districts for voters rather than safe districts for politicians. It would cost taxpayers well under $100,000 every 10 years, with most of that spent on public hearings held around the state to get public input. Compare that to the $3 million and counting that has already been spent or committed to have a private law firm draw the voting maps back in 2011 and then have the state defend the gerrymandered districts in the courts. When this legislation is introduced it should have a public hearing and a vote in both houses of the state Legislature, and then Gov. Tony Evers should sign it into law. In addition, nonpartisan redistricting should be incorporated into the biennial state budget, which will be in effect through June 2020. Given that the nonpartisan process will be less expensive than what we have had in the past, it will free up needed tax dollars for better pursuits than rigged districts. 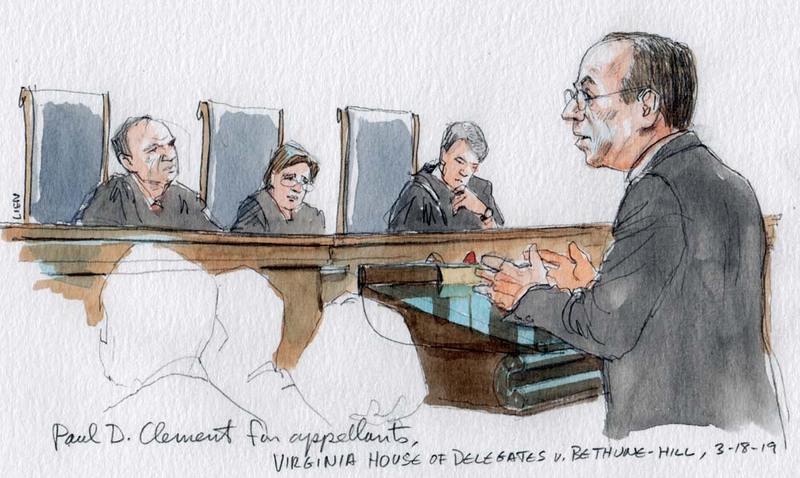 Justices will hear about racial gerrymandering in Virginia for a second time this month. 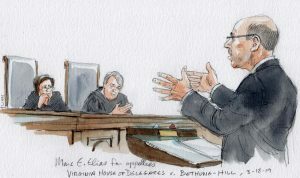 The oral arguments come after a dizzying series of court challenges that stretch back years. The most recent development is a series of new maps for two dozen House districts – several that transformed safe Republican seats to Democratic territory. Legal expert Rich Kelsey says this case will not be like most oral arguments at the high court. Carl Tobias at the University of Richmond Law School says that means justices will be wrestling with whether the three-judge panel properly applied the law to the facts. “Some of that delves into the evidence and who you believed and credibility and those kinds of questions, which the Supreme Court is going to have trouble second guessing the three-judge panel because they haven’t heard any of that evidence," adds Tobias. If the justices decide that House Republicans have standing to sue, and they agree that the old maps were not unconstitutional that could throw the June primaries into chaos. Gov. Larry Hogan has filed a brief with the U.S. Supreme Court, seeking to back up the claims of Maryland residents who argue the state’s 6th Congressional District was unconstitutionally gerrymandered. The Supreme Court is scheduled to hear arguments March 26 in a case in which Republican voters argued their influence was diluted when the district was redrawn following the 2010 census. The district stretches from Western Maryland into Montgomery County. The case dates to 2013 and federal judges previously ruled the boundary lines were unconstitutional and the map should be redrawn. Hogan, a Republican, created a commission to suggest new boundaries, while Democratic Attorney General Brian Frosh of Maryland appealed the order to the Supreme Court. And when that happens, residents of those districts — especially moderate voters — have little means to “influence the policy making process,” Hogan and Schwarzenegger wrote. They compared gerrymandered districts to the Harlem Globetrotters: Everyone knows which party is going to win ahead of time. “Partisan gerrymandering, by design, decreases electoral competition in general elections and democratic accountability along with it,” they wrote. 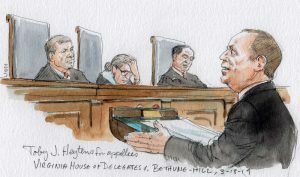 The Hogan-Schwarzenegger brief is among several amicus briefs filed in the case in recent days. “The cycles of extreme partisan gerrymandering are self-perpetuating, with partisan and mistrust begetting still greater partisanship and mistrust,” they wrote. As the court case plays out, Hogan’s redistricting commission has a meeting scheduled Tuesday in Montgomery County. Also, Hogan has introduced legislation in the General Assembly to create a nonpartisan commission to draw district boundaries in the future, but the legislation has not advanced.